Tá beirt mhúinteoir Tacaíocht Foghlama ag Gaelscoil Chluain Dolcain agus beirt mhúinteoir Acnhainne. Go dtí 2012 théadh daltaí amach ó seomra ranga go dtí an Múinteoir Tacaíochta Foghlama / Acmhainne. 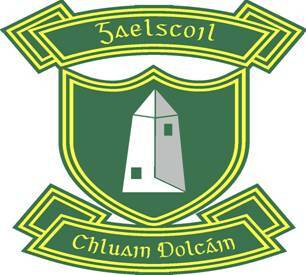 I ndiaidh roinnt mhaith taighde a dhéanamh shrochraíomar triail a bhaint as Cómh-mhúinteoireacht don scoilbhliain 2012-2013. don scoilbhliain sin théadh na daltaí amach as an rang go dtí an Múinteoir Tacaíochta / acmhainne ceithre lá in aghaidh na seachtaine agus bheadh lá amháin I gceist le tacaíocht sa seomra ranga. D'eirigh thar barr leis an gComh-Mhúinteoireacht anuraidh agus dá bharr sin don scoil-bhliain 2013-2014 tá dhá lá (40%) I gceist.